As most of you know, VNN attended Otakuthon a few weeks ago, and of course, what is a convention without getting merchandise. With that being said, I (Monds) got a few things while I was there, and I will be giving you my thoughts on them. 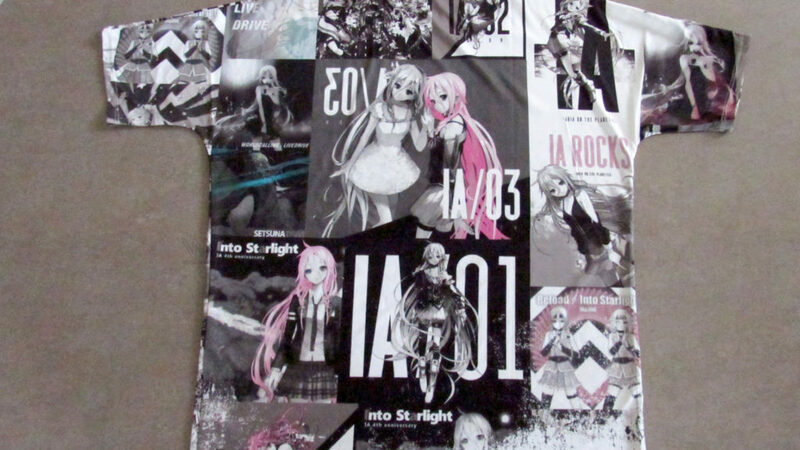 Of course it will be mainly IA stuff since this was the main VOCALOID event at Otakuthon. I have been wanting to get this plushie for some time, but the shipping is quite high, therefore, when I seen it at the booth, I definitely was gonna grab it! 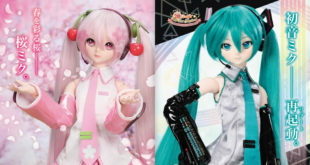 I have to say, it is big bigger than I expected, which is a good thing, but it is a bit bigger than some of the smaller VOCALOID plushies that I own. 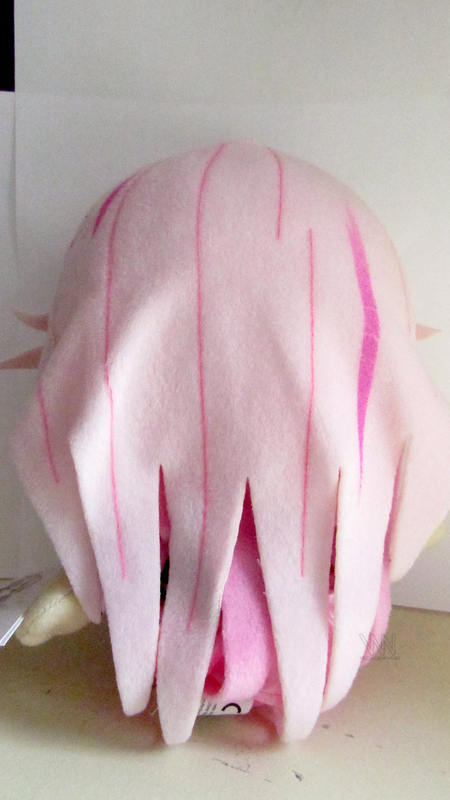 As for the plushie itself, the material quality is really good, meaning it wont fall apart or start to string away in no time. 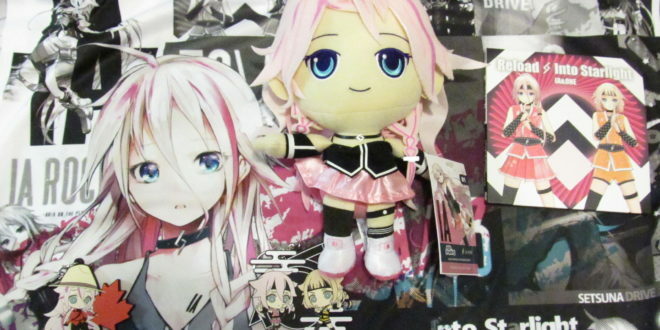 All of IA’s details are on the plushie, sometimes with plushies, they tend to leave out some of the minor details. She is quite soft, I have to say. She is quite cute and couldn’t help but love it. Also, one little thing that is nice, since I like to sit the plushies down, she actually stays sitting quite well compared to some. There are currently four of these left on Tokyo Otaku Mode, you can find those here for $33 USD! This has to be one of my favorite t-shirts that I have of VOCALOID, I have quite of few of them actually. Not saying the others are not great, but this one I instantly fell in love with. There is so much going on in this shirt, yet, that is what makes it appealing, as well as the colours in it. 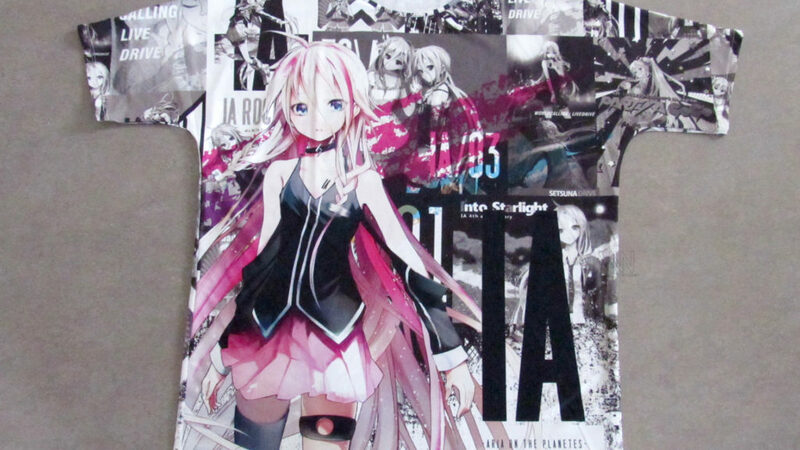 The huge IA in front, along with a bunch of smaller images of IA surrounding her is just perfect for anyone to show how much they love IA. Many of which are very recognizable. It is quite flashy too, I feel like people would notice me from quite a distance. 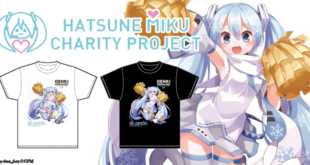 It is also very comfortable, the material is similar to that of a sports jersey, very lightweight and the wind breezes right through it, which is perfect for warm days like conventions. I wore it for my flight back home and I was glad I did, planes can get quite warm and this shirt helped me keep cool. It is definitely one of the most comfortable shirts I have as well. The price was a bit high, however, if you look at all the details in the shirt and the material that it is made out off, it’s not so bad and well worth it. 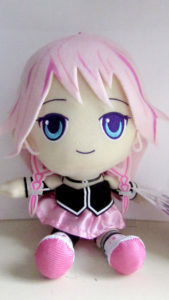 I will say it now, I love key-chains, I have a bunch of them from many VOCALOIDs and I will be getting a ton more, this I can guarantee. 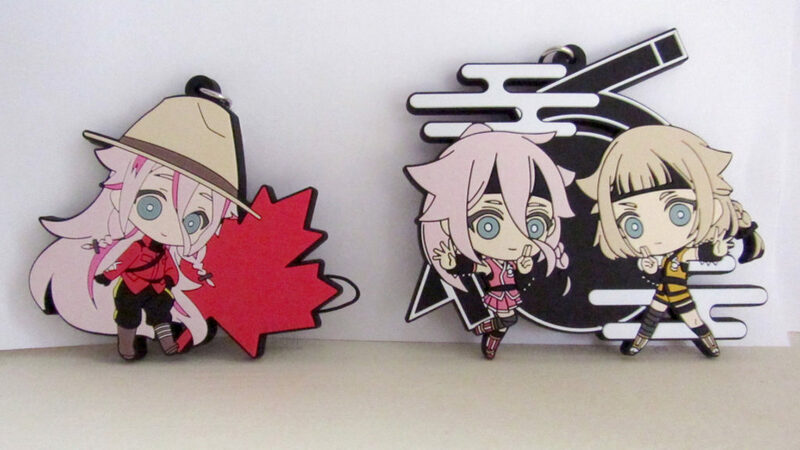 Of course, this means I had to get IA key-chains, it was irresistible. Of course, I got the Canadian one since, well, we are in Canada and I am Canadian, “Eh'”! The other I got was IA and ONE with their Reload outfit. Both of these key-chains are quite adorable, both are made of a strong rubber material. A very thick one so it should not crack that easily. Lastly, I got the Reload and Into Starlight Special AR Live Showcase album and DVD. 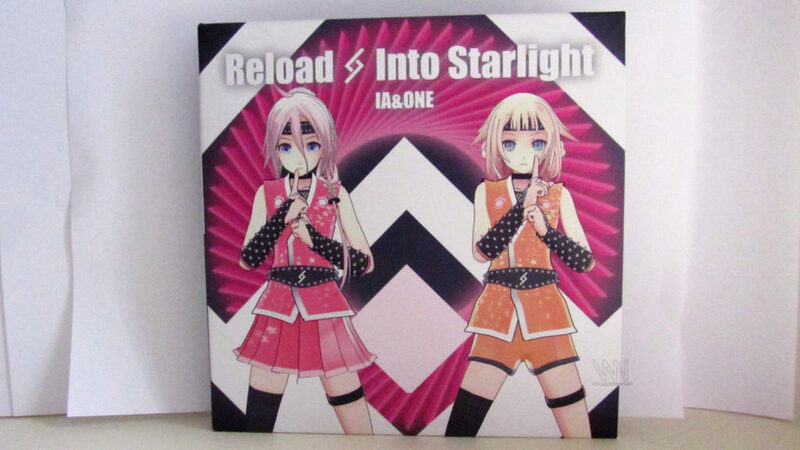 One CD of course has Into Starlight and Reload as well as instrumental versions. The other, is a DVD featuring an AR video. Now this, I will say I was expecting just Into Starlight and Reload in AR, but it actually turns out to be the entire AR part of the stream that was shown, which is about 25 minutes of video. If you watched this, you will know what I mean, if not, it has songs such as; Shooting Star, Mirai by ONE and Tokyo Real World, and, of course Reload and Into Starlight. On top of all that, you get some dialog of IA and ONE speaking which is always adorable at any time. You can purchase this album on CD Japan for 2000 JPY ($18 USD) here. Bonus: I also got a Touhou album from East New Sound on top of all this and it is a great album! 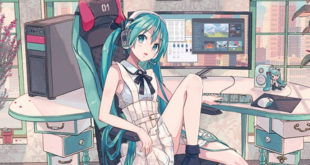 If you guys enjoy my reviews like these about merchandise, I have some other VOCALOID products of Luo Tianyi, Stardust, IA, ONE and much more which I have not talked about yet, they are somewhat older products and some more recent, but, if people are interested in hearing about those let me know in the comments!